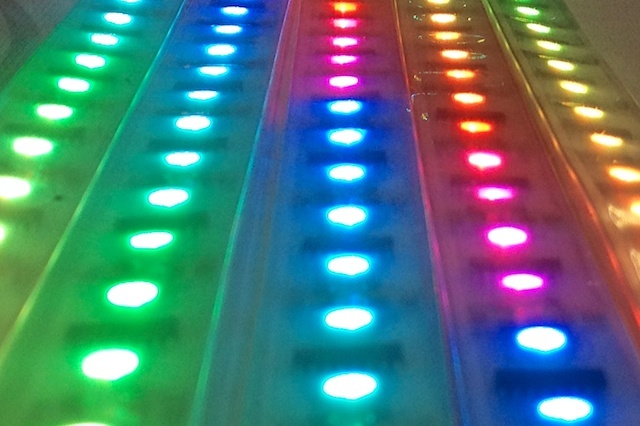 Nothing fuels the projects of MAKE:SF better than LEDs. Among the makerspaces represented in Expo Hall at Maker Faire this weekend is one which offers regular meetings, cheap dues, great venues, and no lease commitments. That’s the formula for MAKE:SF which holds regular meetups at hosting business locations. The cost to join this makerspace is a mere $10/six months and it’s optional. How’s that for a deal? Back in 2007, Andrew Milmoe had earned his Master in ITP and moved to the Bay Area. It didn’t take long for him to feel a yearning for the technical camaraderie he had left behind at NYU. He longed to be among likeminded makers and decided to do something about it. Andrew set up a Meetup.com group which triggered of flood of interest which now stands at 1,700 names on his mailing list. MAKE:SF holds regular meetings at TechShop and Techliminal. These companies provide a meeting space for free in exchange for drawing in potential customers. The two hour meetups are usually a combination of guest speaker, show-and-tell and technical project. According to Andrew, no projects have proven more popular than those with bright, shiny, blinky LEDs. So why aren’t more makerspaces considering this model? Probably because makers want access to tools. However, at this week’s Make a Makerspace workshop we learned the costs and risks of the dedicated space are high. Perhaps more people should go the low-risk path till they build a community. Perhaps more people should follow MAKE:SF’s lead.